On September 10th & 11th, local families and their children with special needs will take over Ditch Plains Beach in Montauk, NY for their chance to be an athlete for the day. Pictured: AWOW's 2015 Surf Therapy Event in Montauk. Montauk, NY - September 8, 2016 - A Walk On Water (AWOW), a family of watermen dedicated to sharing the therapeutic effects of surfing to those with special needs, is returning to the East Coast this September for their 2nd annual surf therapy event, presented with support from John Paul Mitchell Systems, in Honor of the The Sax Leader Foundation. Building on the success of the 2015 event in Montauk, in which 100 families with special needs children and adults were served, the non-profit is debuting their East Coast Chapter and forecasting another stellar turnout. 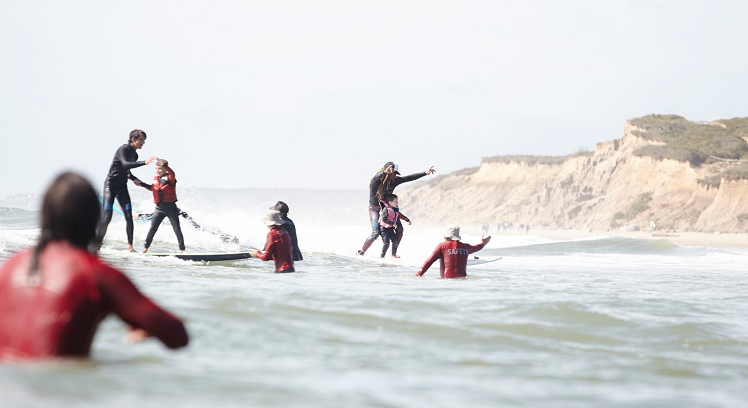 Pictured: AWOW's 2015 Surf Therapy Event in Montauk. Photo By: AWOW. On September 10th and 11th, local families and their children with special needs will take over Ditch Plains Beach in Montauk, NY from 9:00 a.m. to 3:30 p.m. for their chance to be an athlete for the day; catching waves with trained surf instructors and reveling in a once-in-a-lifetime experience. Siblings will also have a chance to get a stoke on a wave right next to their brother or sister. Expect plenty of refreshments from Montauk Juice Factory and lunch courtesy of Ditch Witch food truck. Additionally, The Montauk Beach House will be hosting a fundraiser for AWOW family and friends on Saturday, September 10 from 6:30 – 9:30 p.m., co- produced with Community Collaboration. Hosts will include Julie Gilhart, Quincy Davis, Mike Goodwin, Glenn Glasser, Lee Meirowitz + Gillian Simon, David Matterhorn + Ellen Becque, Lisa Spellman, Jack Luber + Leilani Bishop. Guests will enjoy cocktails, music provided by Jack Luber spinning soulful rock, disco and funk on vinyl, an awards ceremony for the athletes of the day, raffle tickets to win coveted packages, silent auction, and a special AWOW presentation. Silent auction items include Dinner for Two at The Smile located in a landmark 1830s townhouse on scenic Bond Street in NoHo; Table with Bottle Service at the Jane Hotel located on the Hudson River; Canoe Session For Two provided by Malolo Canoe Surf in the East Hamptons; Meet & Greet with Neil Walker and Jay Bruce of the New York Mets; Yankee Batting Practice with the chance for two to partake in the ultimate major league baseball experience, and much more. A Walk On Water (AWOW) enables hundreds of children and adults with special needs, along with their families, to experience the thrill of surfing and its therapeutic qualities. The organization works closely with local communities, businesses and its volunteers and watermen, brought together in service of a shared mission — to help others experience the calming and therapeutic effects of the electrifying, living ocean; and, in the process, showcasing the best of surf culture. 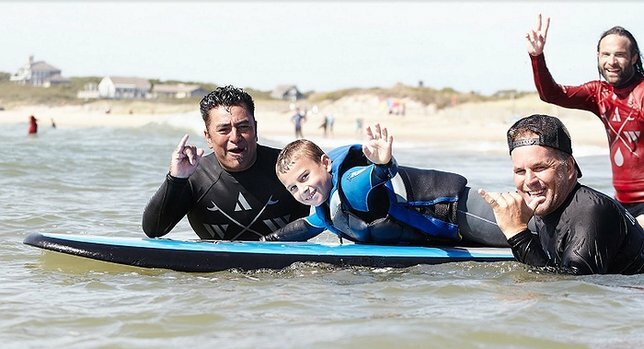 Since its launch in August of 2012, AWOW has served over 500 families and provided surf therapy to nearly 1,000 children and adults with special needs and their siblings. Its goal is to increase the number of children served by at least 30% every year. The organization wants to reach those most in need, who have never had the chance to experience the joy of Surf Therapy. John Paul Mitchell Systems®, a top manufacturer of salon-only professional hair care products, has been serving the professional beauty industry for over 35 years. The company currently produces over 150 professional products (including the brands Paul Mitchell®, MITCH®, Awapuhi Wild Ginger®, Tea Tree, Paul Mitchell® Pro Tools™, Professional Hair Color products, and MarulaOil) that have won over 85 beauty awards. John Paul Mitchell Systems products are sold through distributors to over 100,000 hair salons in North America, and internationally, to thousands of hair salons in 96 countries. John Paul Mitchell Systems offers education to stylists through a national network of educators, and Paul Mitchell Schools trains over 10,000 future professionals in over 115 locations nationwide. Paul Mitchell does not test its products on animals, nor has it ever done so. In accordance with co-founder, John Paul DeJoria’s motto, “success unshared is failure,” the company has a strong commitment to giving back; supporting a wide range of philanthropic causes both domestically and internationally. For more information, visit: www.paulmitchell.com. Subject: LongIsland.com - Your Name sent you Article details of "Families Unite through the Power of Surfing, East Coast Surf Therapy Events This Weekend"